Leiden is a compact, historic city with a superb location: it is nestled right between Amsterdam, The Hague and Schiphol Airport. The Dutch beach and the world renowned tulip area are a beautiful bike ride away. Compared to the other Dutch cities Leiden may be a small convention city, but that is also part of its irresistable charm. Where else in the world do you find 13 museums, hotels and meeting venues within walking distance? Oh and have I mentioned the 28km/17mi of canals criss-crossing through the impressive city centre? 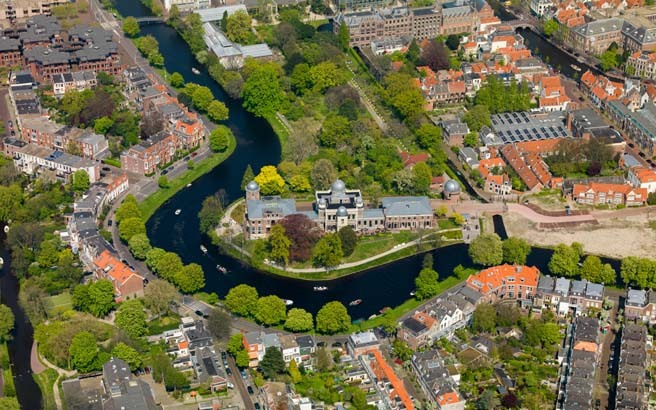 Leiden’s excellent location makes it very accessible for visitors. Schiphol Airport is only 15 minutes away and Rotterdam The Hague airport 25 minutes. Leiden’s Central Station is located in the city centre and a major transportation hub in Holland, making Leiden easily accessible from anywhere in the country. In case you arrive in Leiden by car you have to know that the historic city centre is virtually car-free. But not to worry, there are various ‘Park & Ride’ facilities just outside the city centre with free shuttle buses operating daily. Special arrangements can also be made for larger groups of visitors. I can tell you right now that you will have a pretty hard time to select a venue for your meeting or convention in Leiden. Why? Because they are all equally impressive. Surround yourself in ancient history, meet at a modernised industrial factory, go back in time and stay at a castle, rent out an airplane hangar with a rotating stage, … See what I mean? Naturalis Biodiversity Center is currently preparing its facilities to house a very special guest starting this fall: Europe’s first T-Rex skeleton. Modern (research) meets history doesn’t get better than this! But Naturalis isn’t the only venue (re-)opening in Leiden. Museum Lakenhal, home to many master pieces, will re-open its expanded and modernised doors in 2018. And De Meelfabriek (The Flour Factory), a former industrial building being transformed into an innovative, multi-purpose location, is set to be completed by the end of 2017. 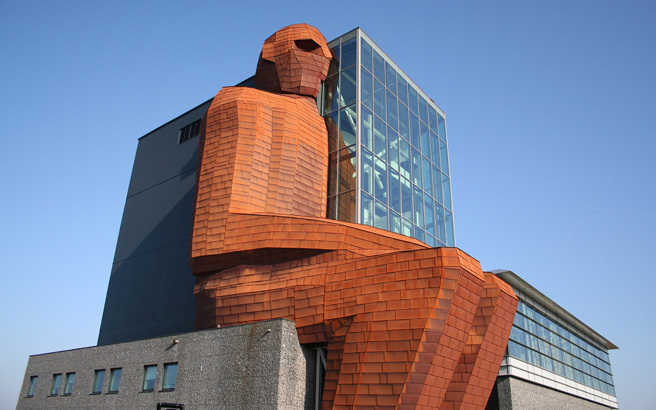 Since Leiden is a historic city many of the meeting venues are housed in monumental or historic buildings. So a classic feel with the most up-to-date meeting facilities is something that most venues offer naturally. Let me give you a few examples. 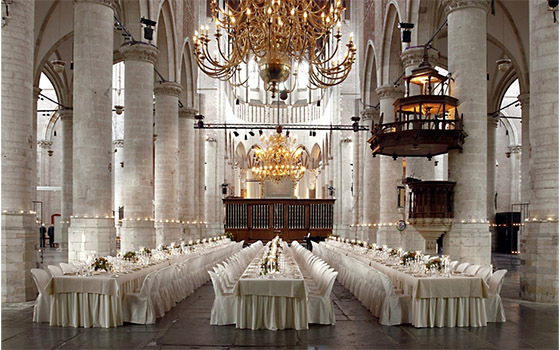 The Pieterskerk is a gothic-church-turned-monumental-event-venue that can host up to 2000 guests. If you are looking for classic yet modern the Nieuwe Energie (New Energie) might be the right venue for you. Or surround yourself with the beautfy of one of the oldest botanical gardens in the world: Hortus botanicus Leiden. It almost feels like every location in Leiden is a hidden secret, but there are a few that might not be on your radar right away. For example, the Theatre Hangar in Katwijk, just outside of Leiden, which is a transformed airplane hangar with a rotating stage. And if you want to travel back in time Castle Oud-Poelgeest might be an excellent venue for your event. Head over to my hidden secrets page to find out more. Leiden is an exceptional city to explore by foot. Wander along the canals, visit one of the 13 museums (including 4 National Museums) or indulge yourself in one of the restaurants and experience Dutch ‘gezelligheid’. Don’t blame me though if you don’t want to leave again! All over Leiden’s city centre you will find interesting specialty shops to spend your money in. Just stroll through the medieval cobblestone streets where you will find anything from home-made chocolate, jewellery, second hand clothing, antique book shops, art galleries, high-end stores and more. For a special view go to La Place Restaurant on the top floor of the V&D department store. And if you happen to find yourself in Leiden on a Wednesday or Saturday you can’t miss out on visiting The Leiden Market, which expands along the Nieuwe Rijn, Botermarkt and Vismarkt right in Leiden’s city centre. It’s the place to get your Dutch cheese and sealed Dutch herring to take home – among many other things! Leiden is home to people from 105 nationalities so no wonder that you will also find cuisine from all over the world here. Looking for the best place for Dutch pancakes? Go to the Beestenmarkt area. If you would like to mingle among Leiden’s locals go to one of the cafes near the Hoogland Kerk. By the way, if weather permits, most restaurants and cafes create outdoor terraces. Leiden may be a compact city, but you definitely need more than a day to discover everything it has to offer. My tip: just add a couple of days prior to or after your meeting to get most out of your stay in historic Leiden. You won’t regret it. That much I can promise.